Voting ended in a tie. Konstantinova must Wear a bandana for a week or Listen to Taylor Swift for a week or Get a tattoo when 19 or at least 26. Konstantinova is raising money to support the Eastern Quoll. Voting is now closed. Konstantinova's pledge is closed for voting, but you can still support Konstantinova and the Eastern Quoll by making a donation using the 'Make a Donation' button above. Help Konstantinova raise money for the Eastern Quoll. 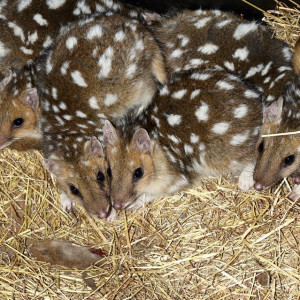 Support Konstantinova Nott by donating directly to the Eastern Quoll.